My baby started preschool today. It wasn’t pretty. Though she’s been in day care since she was 5 months old and her “preschool” is really just a new classroom upstairs from her old one at day care, my daughter wanted none of it this morning. We’ve been on vacation for three weeks, the first two of which we spent with my sister and nephew. This past week, my daughter has been craving attention (During Monday’s quiet time she colored her sheets with a marker, ripped a library book and cut a big chunk out of her hair.) so she and I spent most of the past week joined at the hip. She’d been easing away from me by the end of the week so I really thought she’d run into school today and not even look back. Oh, that was so not the case! I expect by now though, she’s forgotten all about her old mom and has been enjoying the water play with her friends. Still, I take some comfort knowing that she’s about to lie down for a nap with her new I Spy quilt. Most of the squares for this quilt were sent to me (along with some super instructions!) 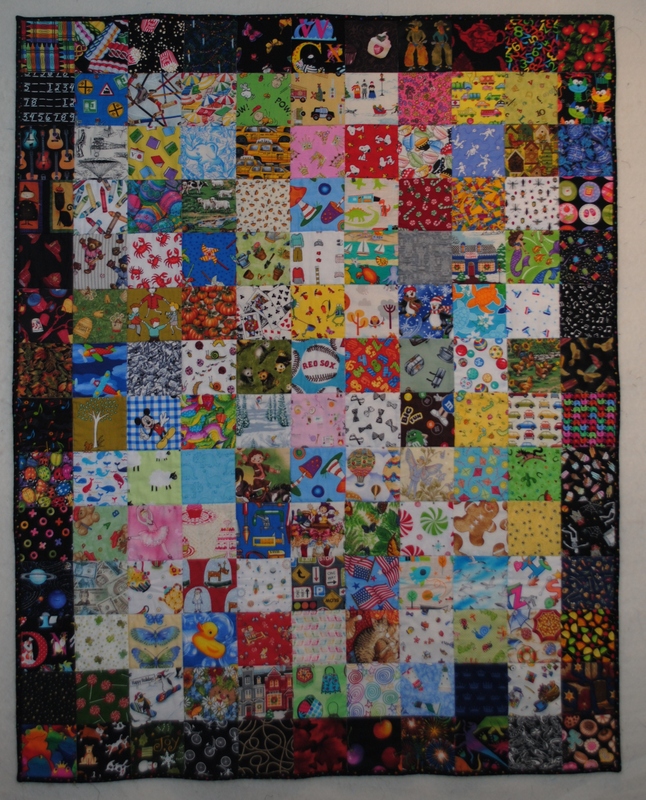 by a dear quilting friend when my daughter was born. (Thank you, Ginger!) Ginger wrote in her note to me that since I was so organized, I’d probably have the quilt done by the time my daughter was three. I didn’t quite make it, but I was close. (My daughter was three in May.) Since my daughter is now older (and much taller) than she was when Ginger sent the first squares, I took the opportunity to add a few more from my stash to make the quilt a little bigger. I’m already collecting fabrics for my next I Spy since I finished this while my nephew was visiting. He left me with a list of the kinds of fabric he’d like in his quilt. Once the fabric is collected, this really is a one day quilt so I didn’t mind saying yes.